L 16 1/2″ (42 cm). 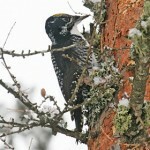 Loud rising and falling “wuck-a-wuck-a-wuck-a,” similar to Flicker but higher and louder. Description: Very large. Perched bird is almost entirely black on back and wings; black bill; red crest; white chin and eye stripes, and long white throat stripe. White flanks and underwing linings flash in flight. Male also has a red mustache. Female is similar but lacks red mustache and has less extensive red on crest. 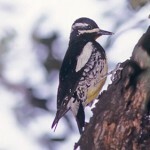 Juvenile resembles adult, but is duller and browner. Habitat: Generally limited to mature forests, often riverbottom forests with a mix of tall living trees and snags. Nesting birds require trees that have at least a 15 inch diameter. Where in Nebraska: Accidental. Probably extirpated from the state. Recent sightings in Washington, Richardson, Otoe, Franklin, Sarpy (Fontenelle Forest), and Douglas Counties. No breeding records for Nebraska. 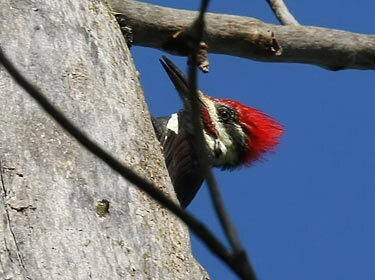 Field Notes: The Pileated Woodpeckers “drum” on hollow trees with their bills in order to claim territory. 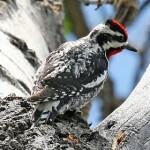 Fun Facts: Largest woodpecker commonly seen in North America.